Salmon is one of the healthiest fishes you can eat. It is full of Omega – 3 fats. Beside the healthy fats, salmon gives your body vitamins such as A, B and D. It is rich of calcium, iron, phosphor and selenium. The combination of all this improves the function of the brain and increases your memory capacity. 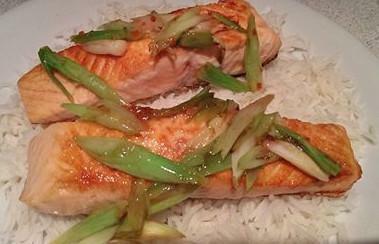 Salmon is best not messed with too much as has strong flavour of its own. But this makes a change from plain salmon and is very quick and easy. Slice onions thinly at an angle. Heat oil over a medium high heat in a non-stick pan. Cook the salmon fillets, skin side down for about 5 minutes.Turn fillets over, cook for another couple of minutes at a lower heat. Remove salmon from pan and keep warm to one side. Add onions, chilli and lime zest to the oil and saute for 2-3 minutes. Add the lime juice and stir in. Pour over the salmon fillets, sprinkle with chopped coriander. Serve with rice and/or green vegetables.